My gorgeous friend Jenna requested a post about the best teacher gift ideas. First off, please know that we as teachers do not expect gifts, as we love our jobs and your children. With that said, if you are wanting to buy your child's teacher a gift for the holiday season here are a few helpful tips and some great gift ideas. 1. Ask your child what his or her teacher likes. The age range of my students is four to five years old and any one could easily tell you that every morning I have a Starbucks or Tim Horton's drink in my hand. Children observe far more than we give them credit for, so whatever your child says the teacher likes start from there. 2. Decide if you will be buying a gift that will stay in the classroom (books, art supplies, games for indoor recess), or if the gift will be for the teacher's personal use. 3. Try not to buy a gift because it is 'trendy'. When candles grew in popularity, I think I received ten of those wonderful smelling objects. Unfortunately, I did not use the candles due to an over active cat in my house. Disclaimer: the gifts mentioned below are in no particular order. 1. Remember my first tip, what does the teacher like? Create a personalized gift basket, the one shown below is tea, but you can customize it to be, a variety of chocolates, a snack basket (sweet and salty choices), or bath products (yes we like bath products). 2.If you have decided that you want to get a gift that will stay in the classroom, this is the way to go! 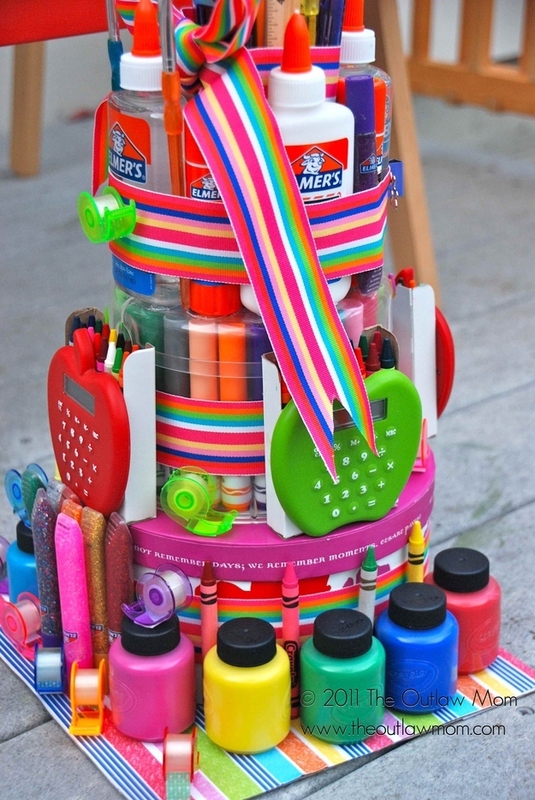 Look at this art supply cake, decorated with glue, calculators, paint, markers and more. A teacher would be thrilled to receive this because we can always use these items in our room. 3. Include some home baked good with your gift, or make your whole gift baked goods. I know I do not get enough time to bake during the month of December. 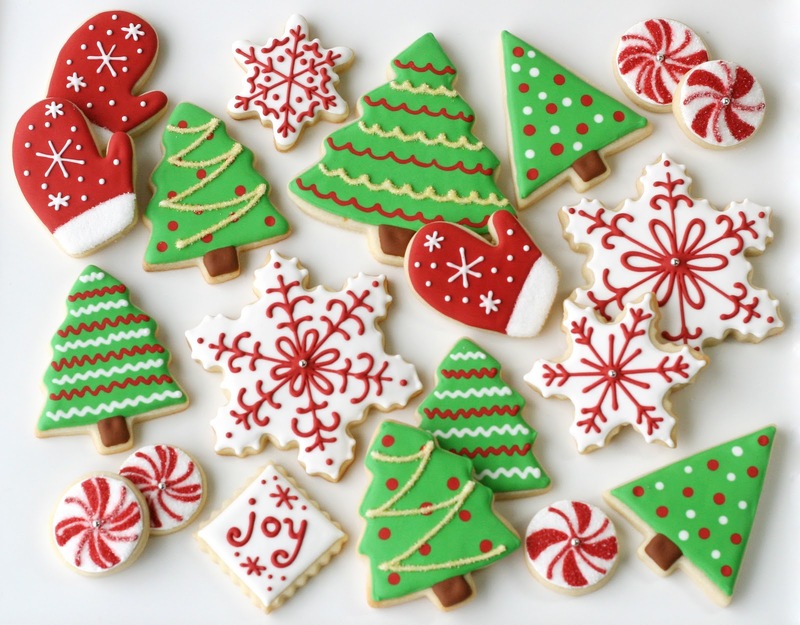 Stick to simple but great tasting treats such as sugar cookies, the easiest cookie recipe I have found is here. 4.I know you're all thinking, " but I don't want to buy a gift card", honestly teachers love it! Feel free to get creative with which gift card you choose. One year, a few of my students' families collected money together and bought me a day at the spa. 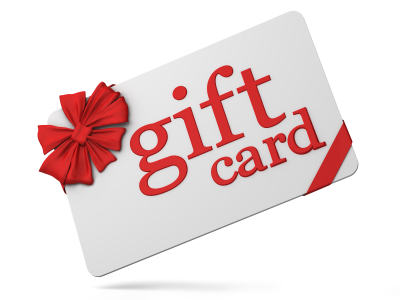 Gift cards for the grocery store or local mall, are ones that we do not receive as frequently, making them a great gift! 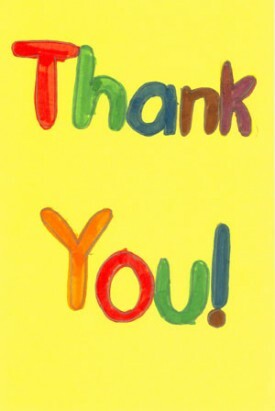 5.Finally, the one thing all teachers really want is a thank you card written by your child. I have a special box that I keep them in (yes all of them! ), and every school year I like to go through it and remember the students I have taught over the years. It doesn't matter if it is the holiday season we always love a thoughtful note. I hope this sheds some light about what to buy a teacher for the holiday season. 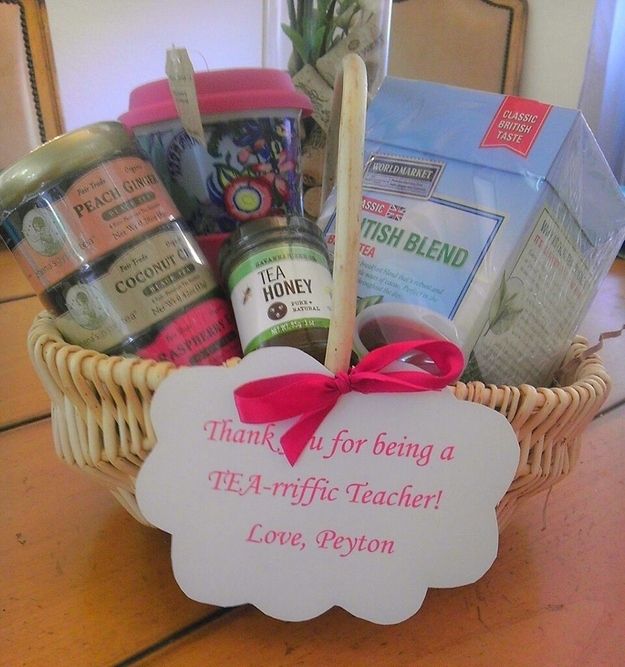 What will you buy for your child's teacher?